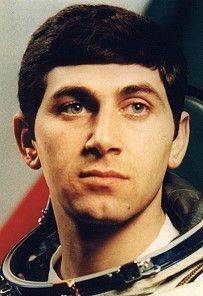 Bulgarian pilot cosmonaut, 1987-1988. Graduated from Air Force School Pilot, Bulgarian Air Force. Status: Inactive; Active 1987-1988. Born: 1961-01-24. Birth Place: Varna. Family: Cosmonaut. Country: Bulgaria. Spacecraft: Mir. Flights: Soyuz TM-5. Agency: Bulgarian AF. Bibliography: 4452. 1961 January 24 - . Birth of Krasimir Mihailov Stoyanov - . Nation: Bulgaria. Related Persons: Stoyanov. Bulgarian pilot cosmonaut, 1987-1988. Graduated from Air Force School Pilot, Bulgarian Air Force..
1987 January 8 - . International Cosmonaut Training Group selected. - . Nation: Bulgaria. Related Persons: Stoyanov. Training group of backup Bulgarian guest cosmonaut for a propaganda flights to the Mir space station. This was a 'compensation mission', since the first Bulgarian mission never reached the station due to a primary engine failure aboard the Soyuz shuttle..
1988 June 7 - . 14:03 GMT - . Launch Site: Baikonur. Launch Complex: Baikonur LC1. LV Family: R-7. Launch Vehicle: Soyuz-U2. Soyuz TM-5 - . Call Sign: Rodnik (Spring - water spring). Crew: Aleksandrov, Aleksandr, Savinykh, Solovyov. Backup Crew: Lyakhov, Serebrov, Stoyanov. Payload: Soyuz TM s/n 55. Mass: 7,000 kg (15,400 lb). Nation: Russia. Agency: MOM. Program: Mir. Class: Manned. Type: Manned spacecraft. Flight: Soyuz TM-4, Soyuz TM-5. Spacecraft Bus: Soyuz. Spacecraft: Soyuz TM. Duration: 91.45 days. Decay Date: 1988-09-07 . USAF Sat Cat: 19204 . COSPAR: 1988-048A. Apogee: 216 km (134 mi). Perigee: 196 km (121 mi). Inclination: 51.60 deg. Period: 88.60 min. Transported to the Mir orbital station a Soviet/Bulgarian crew comprising cosmonauts A Y Solovyev, V P Savinykh and A P Aleksandrov (Bulgaria) to conduct joint research and experiments with cosmonauts V G Titov and M K Manarov. Interim orbit 343 x 282 km. Maneuvered to Mir's 355 x 349 km orbit. Docked 15:57 GMT 9 June to Mir's aft port. Moved to forward port 18 June.